Speedmark Worldwide Cargo Movers, as an IATA cargo agent of major airlines, provides door to door airfreight solutions to its local and international customers via Mumbai port. We have established ourselves as a renowned organization engaged in offering Couriers Logistics Service For Dangerous Chemical. Our airfreight specialists are equipped to offer a fast, economical and solid delivery service. SPEEDMARK’s airfreight services have been designed to meet the critical challenges of our global clients 24 hours a day; 7 days a week. Whether the cargo needs to express delivery, dangerous goods or temperature controlled cargo, we have a suitable service for you. Tharevices offered by us includes International Chemical Courier Service, Courier Service For Dangerous Chemicals, Indian Courier Service For Chemicals and International Courier Service For Chemicals. These services are rendered by the expert professionals, who hold vast experience in this domain. Moreover, our professionals render these services as per the exact requirements of our clients. 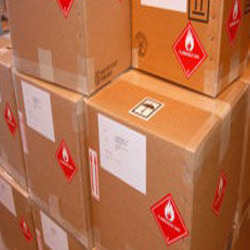 Courier Logistics Service For Liquids & Dangerous Chemical with All Type Cargo Packaging Service. Heat Controlled Goods for Pharmaceutical & All type Solid Fooding. Our main foray is Dangerous Goods and DGR Packaging service in the commercial capital Mumbai. Our Product and services range from Consultancy, packaging & global transportation. We have our own in-house, packing premises with fully trained staff. We provide all kind of services related to the packing of dangerous goods. Welcome to Speedmark Worldwide Cargo Movers. Our company is established over the past 19 years and the management has over 25 years experience in the logistics industry. Operating & could be Specialist Logistics Worldwide Service provide from Sahar cargo complex/ JNPT /Mumbai Port for cargo sending across the globe & cargo coming from any country with a team of dedicated personnel to extend professional service pertaining to any logistics service activities. A team has the efficient and responsible personnel, who will assure you of the Best Services & feedback instantly on the movement of your consignment be it imports or exports. Our Global network of associates will ensure Reliable services at both ends. "SWCM" Company is synonymous with dedication to making the significant difference in logistics. We are a total logistics service provider, always seeking progress to provide better service to our customers. We are one of the leading integrated logistics organizations - providing professional one-stop Freight Services to the World. We offer freight forwarding services by road, air, and sea. Our special services include Offered: International Road Freight Service. Logistics Department: - Our logistics department ensures that the consignment reaches the clients as per the delivery schedule. They are well equipped with the requisite communication gadgets to track the consignment at any given point in time and provide regular and prompt updates to the clients. SPECIALIST LCL CARGO:- Want to ship your freight but don’t have a full container load? With Our Company 'SPEEDMARK', you can move less than container load whenever you need it and we’ll consolidate your sea freight shipments in our containers. With direct access to FAK (freight all kinds) consolidations, we quickly and efficiently import and export LCL shipments worldwide, so you can benefit from an economical sea freight service even with minimal volumes. Our team of managers, sales, and allied staff continuously work towards improving and upgrading the services and work efficiency. The experienced and dedicated staff have the excellent track record in addressing to the varied requirements of our clients. We have separate teams to look after different departments for the more efficient handling of the consignments. They have the requisite knowledge of all the transport logistics processes and are known for delivering exceptional quality of services. Also, our company can employ a variety of logistics details were written down.LCL & Air Cargo Consolidation. Cargo Logistics Services in any Worldwide Country. FCL-LCL Stuffing at Factory or Ware House or Dock PortFCL-LCL De-Stuffing at Factory or Ware House or Dock outdoor to Door Immediate Cargo Delivery ServiceInternational To India & India to International via Mumbai Port.Dangerous Goods Shipment Service By Air & Sea. Heavy Machinery & Project Cargo Shipment Service. According to the statement immediately below the correct import and export freight logistics should respond to get the freight information. Please add the following information. We need the following information to enable us properly quote. Please Email us your correct details as given below for perfect Rate Quotation will be given to you. * Commodity & Weight. * Cargo Size / volume & Packing.